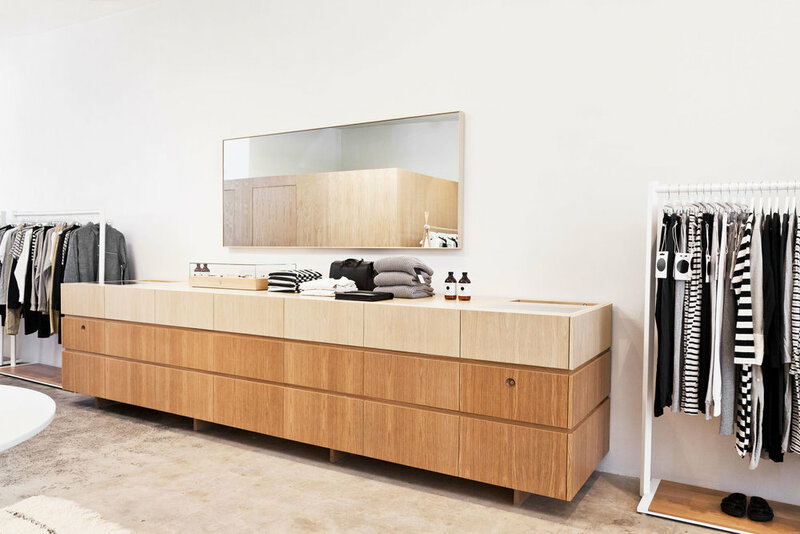 Working in collaboration with Bassike’s architect in Sydney, Akin Creative, create an LA inspired, relaxed and open interior that feels more residential than commercial for the Australian brand's first international store in Venice Beach, CA. Bassike required both built-in and movable fixtures, giving the 1100 square foot store a sense of permanence while simultaneously offering flexibility for future iterations of the store’s interior. They needed to conceal two complex point of sale units, along with the majority of the store’s inventory in a centrally accessible location. They needed multiple mirror moments, flat lay shelving, table top displays and a soft seating area where clients could hangout while shopping. Overall, they asked for a system that didn’t look like a system, one that help distinguished men’s from women’s, and each collection from one another. It was important to us all that the interior of the store support rather than outshine the clothing. When thinking about the design of each individual piece of the store, we drew inspiration from Bassike's restrained, laid back beach vibe and use of honest materials. All of our choices conjured the LA lifestyle, feeling as though you have the same abundance of light indoors as you do being outdoors. We used a palette of understated, luxury materials in their most basic forms. We played with varying angles to emphasize the beautiful light reflections and shadows cast throughout the sun-filled space. The design for the leaning mirror was conceived when Mimi saw a random composition of materials stacked against our studio walls. She took this visual language and designed a mirror using the most beautiful cut of Mountain Calacatta marble and chamfered glass to create the same effortless look. The oak clad fitting rooms feature custom designed hang rails sculpted from solid white oak. The subtle angle allows the rail to catch the clothing and light from above. A 16' long storage unit, designed to resemble a credenza, concealed two point-of-sale units and the majority of the store’s inventory. The hand crafted, two toned finish of the natural white oak appears to have been created by the natural light from the skylights above. For the steel hang rails, a subtle, yet deliberate 45º rotation of the white vertical square posts added shading and dimension, while punctuating the separation between collections. Solid white oak boards, set flush into the metal bases of the movable racks, provided a warm and textured backdrop for Bassike’s minimalist palette. Accessories and knits are presented above a round slab of milky white marble with washes of cool gray and distinct, “ghost-like” markings. The natural stone appears to balance impossibly above four bent glass half-cylindrical bases. The Angled Wood Bar Daybed, from our own collection, creates a playful, gradual shift in color and form from various vantage points throughout the store. The fabric is a soft gray canvas made by Kvadrat, a lightweight fabric that has incredible depth in color. Our Rounded Metal Planters, seen throughout the store, are spun by hand here in Los Angeles and finished with textured, hammer-tone powder coating to almost mimic ceramics. The largest planter is 42” high, making it extremely difficult to produce by hand. They are hollow inside making them surprisingly light to lift. Read more about the project in Sight Unseen.